Seventeen species of snakes live in the Great Lake State. Many of these reptiles are listed on the state and national registers as threatened or endangered species. State law limits the number of all species that can be removed from the wild, and prohibits the shooting of snakes. Only one species of venomous snake resides in Michigan—the Eastern massasauga rattlesnake. This relatively rare rattlesnake dwells in wetlands, including bogs, swamps and riverine woodlands, during most of the year. According to the Michigan Society of Herpetologists, the snake's name comes from the Chippewa meaning "great river mouth." In summer the Eastern massasauga heads upland into grasslands. Thick-bodied and midsize, this snake has a gray or brown background color with a row of large dark splotches running down the back. Some individuals might be entirely black. Although it is venomous, people and domestic animals bitten by this snake usually survive if they receive prompt medical or veterinary treatment. While it's unlikely the average Michigan resident will come across a rattlesnake, that's not the case with various other species. Common snake denizens of Michigan include the small, olive or brown Butler's garter snake; the medium-sized, brown or green garter snake, with three yellow stripes on the back; the brown snake, which features black dots and crossbar patterns on the body; the larger Eastern milk snake, tan or gray with brown or red blotches; the small gray or brown red-bellied snake, and the Northern ribbon snake, a thin brown or black reptile with three white or yellow stripes on the back. 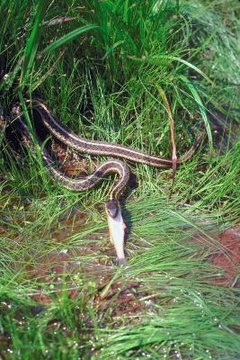 While the Northern ribbon snake prefers wet areas, the other common species can be found in urban, suburban and rural areas. Among the species protected by state law because of their declining numbers are the black rat snake, a large snake with a white throat and chin; Kirkland's snake, a small brown snake with a red belly and black head; the large, tan or yellow fox snake, featuring a red or orange head, and the large gray or brown Northern water snake, an animal with darker blotches or bands on the body. Because of its defensive behavior when startled, the medium-sized olive, brown or black Eastern hog-nosed snake is in decline because people mistakenly believe it is dangerous. The copper-bellied water snake, a large brown or black snake with a reddish-copper belly, is extremely rare in the state. Formerly common, the blue racer—a big snake with smooth gray or blue scales—has declined significantly. The smooth green snake, another once-common species, is in decline because of vulnerability to pesticides and herbicides. Some snakes inhabit very specific areas of the state. These include the thin and brown or gray queen snake, which loves water and is found in the southern Lower Peninsula, and the black ring-necked snake, so named because of the yellow ring around the neck, which is found on Lake Michigan islands. What Type of Snakes are Found in Connecticut?